Denny Jump (Bellevue, WA, United States) on 5 March 2012 in Landscape & Rural. Agree on the patterns revealed at this stage in the seasons - I always think it reveals all the decisions trees make in becoming what they are ! It's just fascinating all the different shapes that trees are. . . much like people. Super shot Mr J.
I like the trees in winter, their nudeness reveals how they realy are and we see their inner beauty. @Steve Rice: Thanks very much, Steve! Fantastic colors and silhouettes, Denny - beautiful! This is beautiful. You caught it so well. Beautiful scene...nice layers clouds. perfect sunset photo. Beautiful Denny, these photos speak to the soul. @Williams: What a nice thing to say - Thanks very much Paul - safe travels! A very pretty shot, Denny, with a sweet movement in that silhouetted land that anchors the charismatic winter trees against a sky for the eye. @Rick: Thank you very kindly, sir...I do love skies...this was a neat one that night that ended a desparate search for "prettiness" by yours truly! Cheers! 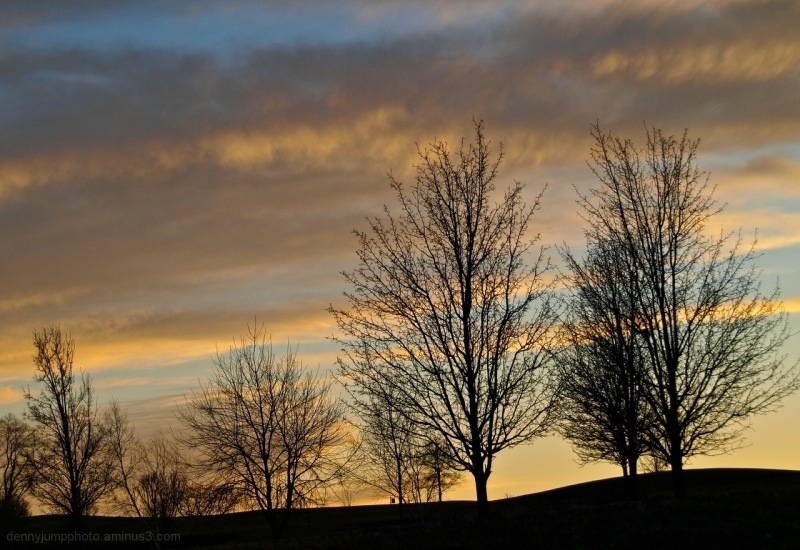 Great network of branches that you've captured here; backlit by a beautiful sky! @Steven: Hi Steven - Thanks very much, sir! @john4jack: Hi jack - Thank you so much - I loved your B&W snow from yesterday - sorry I did not get a chance to comment! Beautiful color! I love bare trees. They make such wonderful silhouettes! This is very beautiful detailed silhouettes with beautiful color banding in the sky ~ great shot! @RBL: Thanks Rutho - I got more - you'll probably be sick of them...Really like that one you have today really a great theme and processing! Wonderful patterns your created in this silhouette shot. Beautiful composition, Denny! I like how you minimized the land (and put it into silhouette) to feature the color and patterns in the clouds. very nicely composed! the silhouettes look fantastic against some lovely colour tones in the background! the mood is wonderful as well!